The Massachusetts House of Representatives recently passed a bill that will raise the state’s minimum wage from $8 to $11 an hour by 2017—the highest state minimum wage in the nation. The Senate already approved the bill, and Governor Deval Patrick is expected to sign it into law within the week. 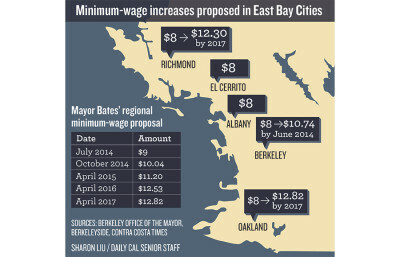 Mayor Tom Bates’ proposal to create a regional minimum wage across the East Bay is generating interest among officials in various cities. 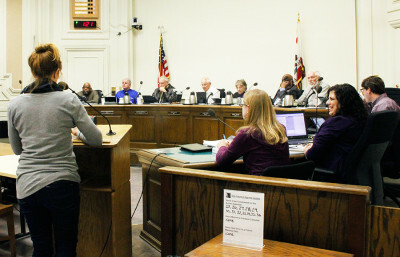 Berkeley City Councilmember Jesse Arreguin, who supports the minimum wage increase in the city and region, said although the increase from $8 to $12.53 is a “step forward,” it is not enough to support people working in jobs like retail and food service. Look for us upstairs or in the basement. Join us for our weekly meeting! We are planning our route to victory on November 4! 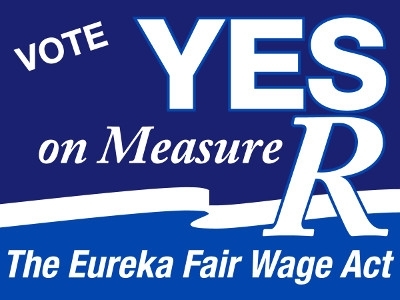 We will meet as usual at the Labor Temple, 9th and E, Eureka at 615 pm. Look for us upstairs or in the basement. A BIG THANKS to all who have helped us get this far! 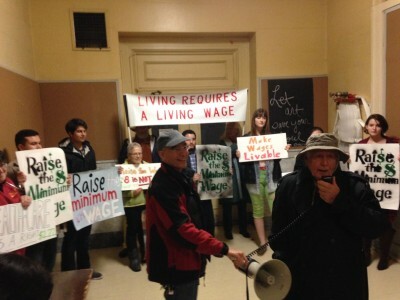 Seattle’s $15 Minimum Wage Will Do What? The former Red Lion Hotel in downtown Seattle sold Thursday for $130.7 million, or nearly $410,000 a room, the highest price ever paid in the metro area, according to hotel experts. But the record price for the 319-room hotel, now known as Motif Seattle, could quickly be surpassed by the pending sale of the 120-room Hotel 1000: Two groups are buying it for $63 million or about $525,000 a room, according to a report this week in The Wall Street Journal, which didn’t identify its sources. “It is the highest price paid (per key) ever for a hotel in Washington state,” said Chris Burdett, senior vice president of CBRE Hotels in Seattle, which was not involved in the transaction. NEW YORK (Reuters) – New Yorkers strongly back hiking the minimum wage, a poll showed on Thursday, while their support for the police department hit new lows under a mayor seeking to improve community relations. Half of the city voters surveyed said they would support an increase in New York’s minimum wage to $13 an hour from $8, while a third approved of a hike to $10.10, the poll by Quinnipiac University showed. Only about one in 10 said the rate should stay where it is, it said. The findings come in the wake of New York State Assembly Speaker Sheldon Silver’s amending of a bill to boost the minimum wage. The proposal, which Silver called a top priority as the legislative session comes to a close, would raise the minimum wage to $10.10 an hour, indexed to inflation, and allow municipalities to push wages as much as 30 percent higher. 21. Do you think the minimum wage in New York City of $8.00 an hour should be raised to $10.10 an hour, or to $13.00 an hour, or shouldn’t New York City’s minimum wage be raised?